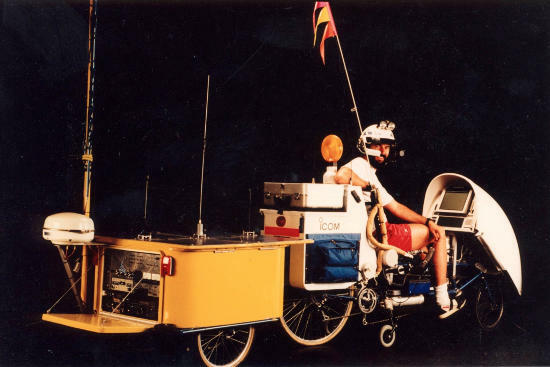 A fellow radio amateur posted an old picture somewhere of Steven K. Roberts on the Behemoth "Big Electronic Human Energized Machine, Only Too Heavy" bicycle, a recumbent bicycle with computers and amateur radio as a joke suggestion to me. But this is more than just a joke to me, I follow the work by Steven K. Roberts since somewhere in the 1980s when I saw an article and picture about him in a popular science magazine. Articles and pictures by Steven K. Roberts are now collected on microship.com where some of the old memories seem to have gone the way of the 404 after almost 30 years of gathered digital history have been reorganized. Steven is still busy with the same ideas, nowadays on a nice sailboat, as can be seen at Blog - Technomadic & Gonzo Engineering with regular projects. Browsing the site I found some interesting videos such as the ones in Vintage Video: Computing Across America - Hackaday and Computing Across America - April 1988 - Louisville WHAS11 Bernson's Corner - Youtube.com. This page generated in 0.003779 seconds.